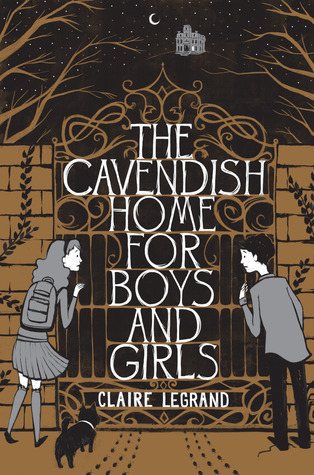 The Cavendish Home for Boys and Girls by Claire Legrand. Simon & Schuster, 2012. Currently Available. Face Value: While this cover isn’t quite a scene that we see in the book, it captures the tone quite nicely. And the inclusion of both Victoria and Lawrence on the cover subtly suggests that this book will work for boys and girls, without pretending that it has nothing to do with girls so boys will read it. The colors, the font, and the particular style of the illustration is contemporary and creepy and a good fit for the book. Does it Break the Slate? YES! Victoria Wright, you are an amazing Slatebreaker, right up there with Matilda and Coraline, the young women whose stories inspired yours. But don’t be fooled – Victoria is also completely her own character, both fastidious and heroic, who takes down a villain and rescues her classmates through both her own strengths and flaws. Who would we give it to? As I mentioned above, there are beloved children’s stories that clearly influence Legrand’s writing. Don’t worry – that’s not any indication that this story is anything less than original. But readers of Roald Dahl and Neil Gaiman will find a lot to love in this book. Review: Victoria Wright is a perfectionist. I can relate to that – I am too. When the book starts, she is utterly distraught because she has a glaring B amidst the As on her progress report. I can relate to that too – once during a parent teacher conference, my mom said without irony, “Sullivans don’t get Bs.” There are a lot of good qualities associated with Victoria’s perfectionism. She’s intelligent, self-sufficient, capable, no-nonsense. But it can also be alienating – she cuts herself off from friendships and meaningful relationships with others. Her only friend Lawrence isn’t really a friend, Victoria tells herself. He’s more of a “project” and she is often infuriated by his relaxed untidiness and love of music such that he forgets about other important things like homework. But then Lawrence disappears. And no one seems to notice, or be bothered except Victoria. As she investigates his disappearance, she discovers other missing children, whose absence is similarly ignored, and becomes more and more drawn to the sinister Cavendish mansion. Knowing the danger, Victoria offers herself up to Mrs. Cavendish, with the intention of saving Lawrence and the other children. Once in the home, she discovers the truth – the Cavendish Home is basically a magical torture chamber, meant to turn misbehaving or outcast kids into perfect, Stepford children. They either come back “changed” or they never come back at all. Legrand dreams up some truly horrifying things that go on here, as well as a truly satisfying conclusion, when the children (led by Victoria), emerge victorious. There are many wonderful things, but it’s Victoria’s character that really elevates this story to a Slatebreaking book. All those qualities I mentioned – they make her a determined and capable hero, who we actually believe is capable of taking down Mrs. Cavendish. Her best qualities are also intertwined with her negative qualities. Like Meg in A Wrinkle in Time, Victoria’s potential for heroics is inextricably linked with her faults. And when the story comes to its inevitable resolution, after she goes through this experience and comes out a hero, she is changed, but she is not repentant nor completely different. She’s still a self-assured, prickly perfectionist. She’s become more aware of others, and understands more deeply that she needs other people in her life, but she has not changed. We wouldn’t want her to. But over the course of the book, when Victoria realizes just how much Lawrence means to her, we really see this friendship for what it is – a complicated relationship between two people that care about each other, despite and even because of how different they are. Characters aside, the quality of the writing is really excellent. It’s always Slatebreaking when books for children choose not to underestimate their audience, and this book is smart and scary. It’s actually scary, in the way that books like Coraline or The Witches are actually scary, and Mrs. Cavendish is a deliciously terrible villain. And like those great books, the children in the story are the true heroes, who rescue themselves and prove to the clueless adults in their lives just how capable and important they are. This is a book about individuality, and what lengths people will go to either limit or foster that uniqueness. Luckily, we have characters like Victoria who are capable of protecting and fighting for it. This entry was posted in Middle Grade, Reviews and tagged Friendship, Horror, Individuality, Middle Grade, Speculative Fiction. Bookmark the permalink. Sounds excellent! One for the Christmas list, I think.